Who is Nepal’s First Female President? Bidhya Devi Bhandari, the current vice-chair of the ruling Communist Party of Nepal (United Marxist-Leninist), was elected as Nepal’s first female president. She will be the second person to hold the position since Nepal abolished its monarchy in 2008, but her victory comes with much controversy. She replaces Ram Baran Yadav, who was elected in 2008 as the country’s first President. Longtime women’s rights champion Bhandari won the election in parliament last Wednesday with 327 votes of the total 541 ballots against Congress party leader Kul Bahadur Gurung. Bhandari is a close ally of the newly elected Prime Minister, Khadga Prasad Sharma Oli. 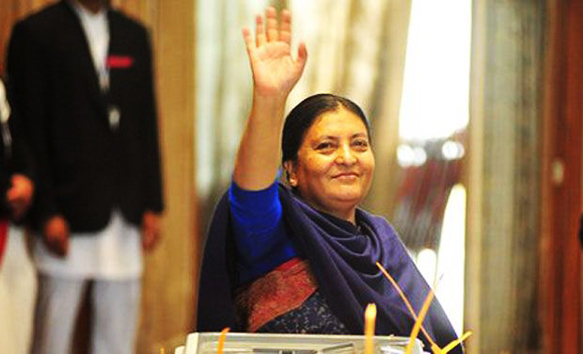 Bhandari was first elected to parliament after her politician husband, Madan Bhandari, was killed in a car accident in 1993. Before becoming the vice-chair of the leading Communist Party, Bhandari held many positions as a minister, most recently serving as the defense minister from 2009 to 2011. She held this position at a time when Maoists leaders pressured the government to integrate their former rebel fighters into society and the army. In 2006, Bhandari led demonstrations against the former King Gyanendra to abolish the monarchy and instill democracy. As a long-time champion of women’s rights, Bhandari lobbied for a new constitution, which requires a woman to either hold the position of the president or the vice president, and a one-third quota for women in parliament. It also requires that women are appointed to all government committees. The new constitution and the election of Bhandari are Nepal’s attempt to change the way of life from a traditionally male-dominated society to one in which women have equal opportunities and legal rights. Although Bhandari has lobbied for the inclusion of women in politics, she has been criticized for defending her party’s positions on the new sexist citizenship provisions, and her alleged comments about women being devoted to a man. In a program discussing the new constitution, a local newspaper reported that Bhandari criticized women’s rights advocates for being influenced by Western values. Bhandari defended her party’s position on the citizenship provisions included in the new constitutio—which does provide quotas for women to serve on constitutional bodies—but the discriminatory provisions require a child of a Nepali woman to be born in Nepal to attain citizenship. However, this is not the case for Nepali men. Children born to Nepali men outside Nepal can attain citizenship through descent, but children born to Nepali women outside Nepal cannot. The provisions further discriminate by requiring Nepali women who have children with foreign men to be married to them in order for the children to attain citizenship. Not only do the women have to be married, but the foreign husbands have to become Nepali citizens before the children can attain citizenship. These restrictions do not apply to Nepali men. Children of single Nepali men can attain citizenship regardless of their mother’s citizenship or family structure. The controversial constitution has caused an uproar in Nepal for over a month now. The non-stop protests have led to more than 40 deaths and supplies of everyday goods have also been disrupted. Rishika is in her last year of law school. She is a self-proclaimed coffee addict, foodie, and a news junkie. She has a deep love for politics, culture, religion, tackling misogyny, and sociology. When she’s not busy reading or drinking coffee, she enjoys watching horrible reality, and traveling.